Your coolest item for college and your most expensive college supply are probably one in the same if you have an iPad. It doesn't need to be said that that iPad or tablet device is an important and expensive part of your supplies for college. So keep it in the best condition possible. By using this Orange Trim Damask iPad Bag to store and transport your tablet, you'll be much less likely to drop it. And what if you get caught in the rain and don't have a way to cover your tablet? Water and iPads won't make a good mix. Dropping your iPad can also lead to a scratched screen. Some risks just aren't worth taking, especially when they're unnecessary risks. Keeping that tablet in the best condition possible is easy with the right dorm stuff, such as this college bag. 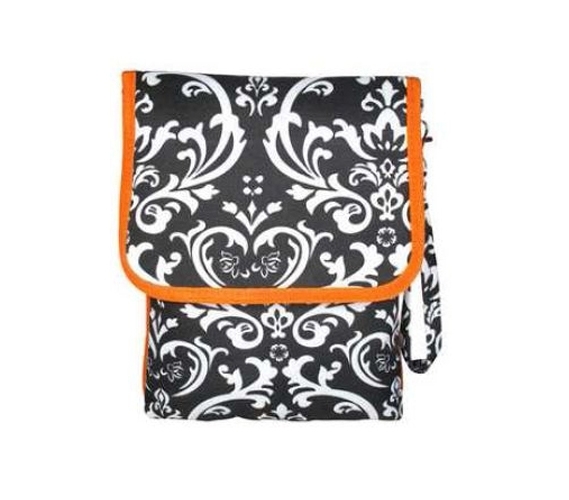 With its orange lining and damask pattern, this iPad bag will be just as stylish as any other purse or small bag for college students that you'd otherwise carry. For maximum protection, this small bag will fit right in the back of your college backpack or tote bag for easier transportation. If not, use the carrying strap to hold securely to this bag if you're running late to class!